This gemstone granite is a unique mix of red/pink feldspar, white/gray quartz and green epidote. It was named for the Unaka Mountains in South Carolina where it was discovered. While most unakite comes from the US it is also found in South Africa. 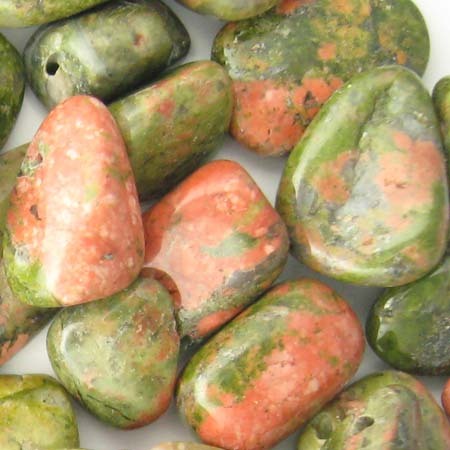 Unakite balances emotions with spirituality and brings a gentle, calm energy to the environment. It is said to treat the reproductive system, help with recovery from a major illness, aid in a healthy pregnancy, and promote the growth of skin tissue and hair.